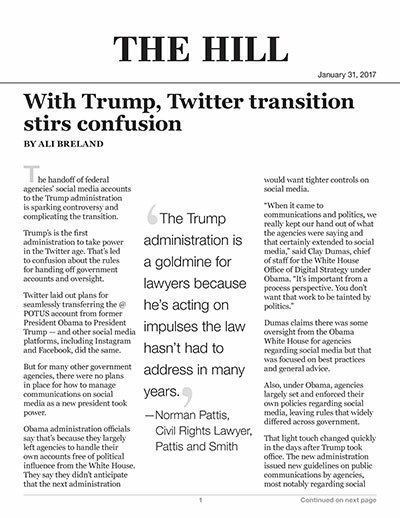 The handoff of federal agencies' social media accounts to the Trump administration is sparking controversy and complicating the transition. Trump's is the first administration to take power in the Twitter age. That’s led to confusion about the rules for handing off government accounts and oversight. Twitter laid out plans for seamlessly transferring the @POTUS account from former President Obama to President Trump — and other social media platforms, including Instagram and Facebook, did the same. But for many other government agencies, there were no plans in place for how to manage communications on social media as a new president took power. Obama administration officials say that's because they largely left agencies to handle their own accounts free of political influence from the White House. They say they didn't anticipate that the next administration would want tighter controls on social media. Dumas claims there was some oversight from the Obama White House for agencies regarding social media but that was focused on best practices and general advice. Also, under Obama, agencies largely set and enforced their own policies regarding social media, leaving rules that widely differed across government. That light touch changed quickly in the days after Trump took office. The new administration issued new guidelines on public communications by agencies, most notably regarding social media. Initial reports said officials claimed they were being told to shut down social media efforts. But the rules and enforcement appeared to vary by agency. Interior was briefly told to stop posting on social media after a tweet unfavorably comparing Trump’s inauguration crowd to former President Obama’s. In another case, the Twitter feed for Badlands National Park promoted climate science in three tweets, before later deleting them, claiming they were sent by an unauthorized employee. The Environmental Protection Agency (EPA) claimed they were told to stop issuing press releases and social media posts, a claim White House press secretary Sean Spicer denied. The Agriculture Department’s research arm claimed it received similar guidance to avoid discussing policy on social media, before that order was dropped. Federal agencies are still posting to social media, though some say the volume and nature of the posts has changed. Critics painted the changes and reports of a social media ban as draconian and were quick to raise alarms about the Trump administration cracking down on information. “Now you have the Twitter president at war with his own employees on a social media battleground. That’s weird,” said Jeff Ruch, the executive director of Public Employees for Environmental Responsibility of the reported ban on EPA tweeting. But the Trump White House insisted that all administrations take steps to control agency communications during a transition. “I don’t think it’s any surprise that when there’s an administration turnover, that we’re going to review the policies,” Spicer said about changes to social media practices. Supporters note that the questions facing the Trump administration are novel ones. Twitter was launched in 2006 and Facebook in 2004, but their use by government really came of age under the Obama administration, meaning many rules and enforcement mechanisms are still unclear. Critics of the Trump administration, though, aren't ready to cut them any slack. They say cracking down on agency social media activity is unprecedented. “We would not give orders to agencies. We would talk to them on messaging,” said a former White House legal counsel under Obama. “Legally there’s nothing that prohibits the White House from clamping down. It’s just not something that you would do." Dumas also said there would have been concerns under the Obama White House about adopting an approach like Trump's. There are many murky questions, though, regarding social media practices. One example is how to address federal employees discussing work on their own Twitter feeds. Some agencies are already trying to clarify such rules. The Interior Department has instituted their own ban on their employees discussing policy. But how they'll enforce that is unclear. National Park Service spokesman Thomas Crosson said violators would likely get a slap on the wrist. For now, agencies and the public are looking for any clarity to ease the transition. And one lawyer told The Hill that how the new administration resolves these questions could end up in court. Norman Pattis, a civil rights lawyer at Pattis and Smith said his firm is closely watching the controversy over agency social media accounts. “The Trump administration is a goldmine for lawyers because he’s acting on impulses the law hasn’t had to address in many years,” Pattis said. "As soon as we saw [reports of a social media ban] six lawyers and myself at the firm had a meeting. We sat down and tried to figure out what’s going to happen next... [It] could very well be legal, but I think there’s something troubling about clamping down on speech," he continued. "We’ll see what happens with that when it plays out in court sometime in the next four years."